The Mediterranean Institute for the Mathematical Sciences (MIMS) has been founded in January 2012 by a group of mathematical professionals in Tunisia. Its mandate is to promote research in and applications of the mathematical sciences regionally and internationally, to facilitate the training of highly qualified personnel, to enrich public awareness of and education in the mathematical sciences, and to setup partnerships with similar organizations around the Mediterranean, in Africa and around the World. MIMS is an institutional partner of the Southern Mediterranean University (SMU, Tunisia). It is run by a board of directors and is presided by an Honorary Chairman (Prof. Yves Meyer, Abel Prize Laureate). The African mathematical community, particularly in North Africa, is growing and consolidating by the day. MIMS is joining sister mathematical centers (CAMS of Lebanon, and AIMS of South-Africa) on the continent. It is the first Institute of its kind in North-Africa. Established in Tunisia, a country with mathematical traditions, a strong (French-based) educational system and a growing community of mathematicians scattered around the world, MIMS aims at bringing this community together and at offering them and to their respected collaborators and guests, a serene and inspiring place to do mathematical research, to discuss mathematical ideas and to organize joint events. 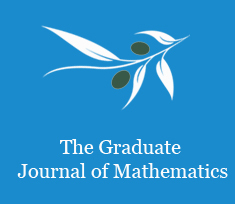 The Graduate Journal of Mathematics is a new and welcome addition to the mathematical journals around the world - since 2016. It is an electronic journal, indexed by the AMS Mathreviews. MIMS runs on private donations. Your financial support is needed and welcome. Please consult our left heading "Donations".